Who said that you have to disconnect while you're on the road? 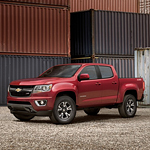 The new Chevrolet Colorado is available with great features that cater to modern drivers. Whether you're looking for features to help you stay entertained on your daily commute in San Benito or you want something that can keep your family busy on long road trips, the Colorado has you covered. You can get this truck with a built-in wireless modem. The modem connects to cellular towers with a compatible data plan. The system then creates a fast 4G LTE Wi-Fi signal for your passengers to enjoy. Multiple devices can be connected at once for web browsing, streaming media, and much more. The Colorado is available at Gillman Chevrolet Buick GMC with a robust infotainment system as well. The large touch screen display can be used to get directions to your destination, find information about local hotspots, and flip through satellite radio channels. You can even connect your smartphone device to make hands-free calls on the go.